This high quality Sentry lateral safe, the 2L4310, comes with UL one hour fire rating. 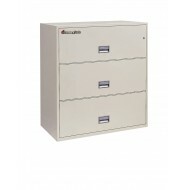 The 2L4310 is a heavy duty file cabinet that carries a UL explosion and impact label. It is a two drawer file cabinet designed to hold letter size documents.Even though it only has two drawers, its width allows for plenty of storage. The 2L4300 is part of the series of the widest lateral safes offered by Sentry. There is plenty of storage in the two wide drawers which will accommodate either legal or lateral sized documents. 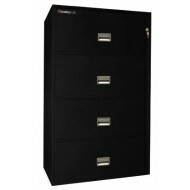 This is a heavy duty safe with a UL impact rating and rugged suspension system on the drawers. 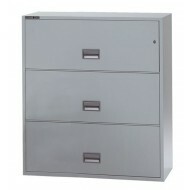 The Sentry 3 Drawer Lateral Fire File provides filing for letter and legal size documents. 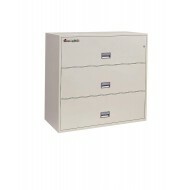 Rated and verified by UL, Underwriters Laboratory this file cabinet has one hour fire protection and impact protection. When dropped 30 feet in a test, this model remained intact and the drawers locked. The 3L3010 has plenty of storage and protection for your files. 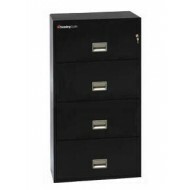 Sentry 4T3120 Vertical 4-Drawer Fire File is designed to hold letter sized documents. 31" deep drawers have easy movement because of the rugged suspension system. This file has exception fire protection with a two hour UL certified protection. In addition this file has impact resistance and explosion resistance certified by UL. 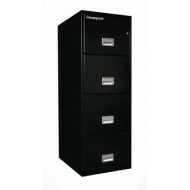 The Sentry 4G3120 4 Drawer Vertical File cabinet comes with superior 2 hour fire protection. This file is set to accommodate both legal and letter size files. 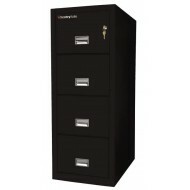 This heavy duty safe has rugged supsension for drawers allowing them to slide in and out easily even when fully loaded. In addition UL, Underwriters Laboratory, has tested this file cabinet for resistance to 30ft drops and explosion hazard. 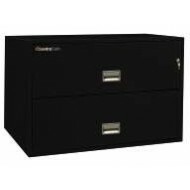 Sentry 3-Drawer Lateral Fire File provides filing for letter and legal size documents.The 3L3610 fire rated cabinet comes with a UL one hour fire rating. In addition, in a drop test of 30 feet the drawers remained locked. This earned the 3L3610 the UL impact label. 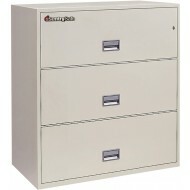 The Sentry 3L4310 is a three drawer lateral file with UL rated one hour fire resistance. It is 43" high and has plenty of storage space for letter and legal size documents. It has heavy duty construction which passed the UL impact test. This model when dropped 30 feet, did not break open and the drawers stayed locked. With one hour fire protection, this is an all round great product for protecting important paperwork. The Sentry lateral safe 3L4300 is a wide safe with plenty of storage. The drawers can be set up to store either legal or letter documents. Underwriters Laboratory, UL, has given this filing cabinet a 1 hour fire protection label. The file cabinet has a one year limited warranty for defects but a lifetime replacement warranty if the cabinet is damaged during a fire.